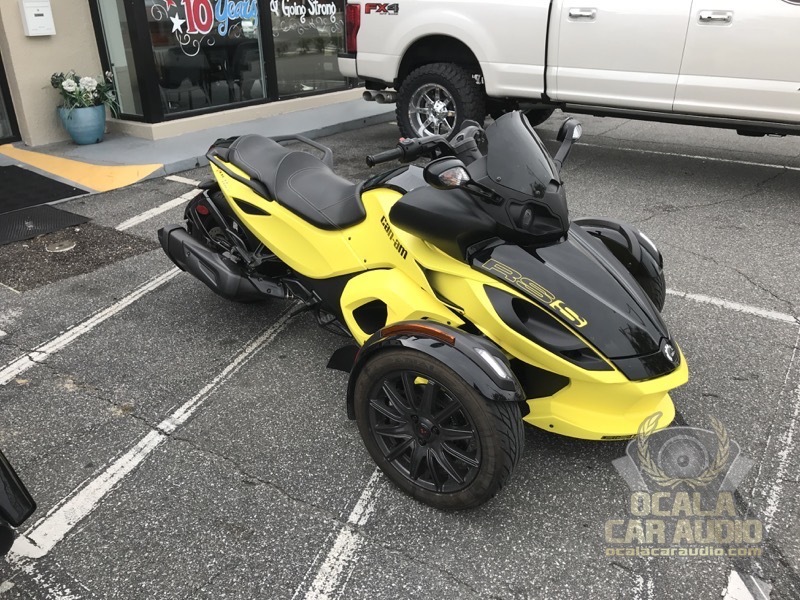 A longtime Harley rider recently dropped by Ocala Car Audio to learn about the Can-Am Spyder SlamPak solution from JL Audio. Having ridden bikes with her husband for years, this client decided she wanted to try out the three-wheeled Spyder. 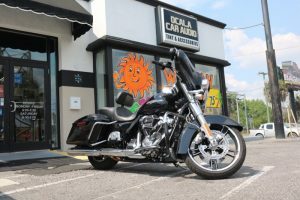 Since she was accustomed to having a sound system on her cruiser, she came to see us to find out what audio upgrades were available. The SlamPak audio system is the perfect solution for this vehicle. Let’s take a close look at what the kit includes. The speaker pods look right at home on this Spyder. The audio system upgrade brings a new level of excitement to this Spyder! 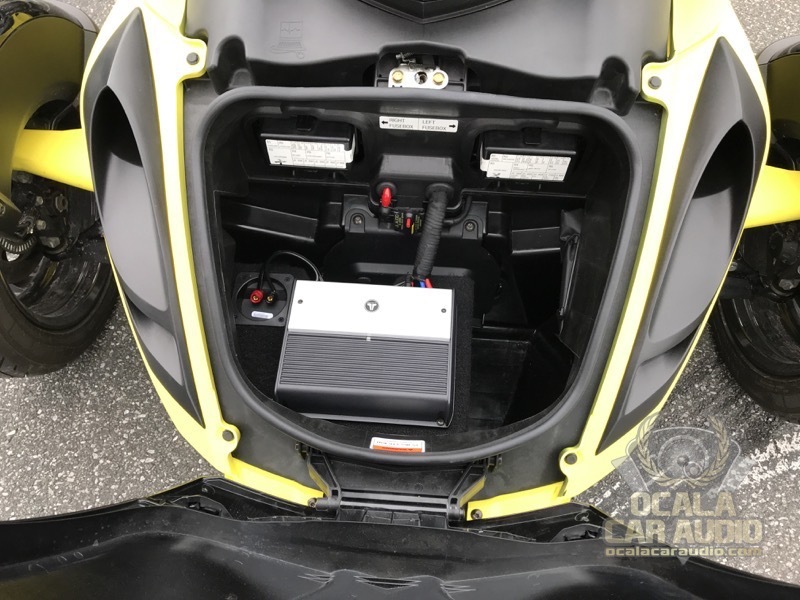 The JL Audio SLPK-CAN-SPYDER1 SlamPak for 2007 through 2016 Can-Am Spyder three-wheelers includes a pair of aerodynamic fiberglass speaker pods, a Stealthbox subwoofer enclosure and a four-channel amplifier, along with all the wiring we need to install the system. The fiberglass SB-CAN-PODS1-M770 enclosures mount on either side of the center console and position the M770-TCX-SG-TB 7.7-inch marine component speaker set directly facing the client. 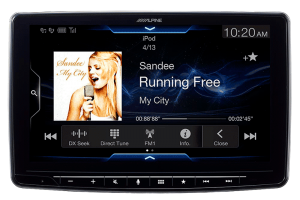 The 7.7-inch speakers offer an excellent balance of low-frequency output and efficiency to ensure that her music will sound great at any reasonable speed. The Stealthbox enclosure is home to a single 8-inch 8W3v3-4 subwoofer in a sealed fiberglass cabinet. The enclosure mounts in the forward storage compartment and provides an impressive amount of bass, given its compact size. The small footprint of the JL Audio amplifier made it easy to fit in the front compartment. The SlamPak system also includes an XD400/4 amplifier that can produce up to 75 watts of power for each of the speaker pods and 200 watts for the subwoofer. We mounted the amplifier on top of the enclosure and fed it power through a JL Audio marine-grade circuit breaker. As you can see from the attached photos, all the wiring is bundled neatly using an automotive-grade cloth tape, and we added heavy-duty rubber grommets where the wiring passes into the storage area. A JL Audio MBT-RX Bluetooth receiver allows the client’s smartphone to serve as the source unit for the system. She can play music that is stored on the phone or stream from her choice of online services directly to the amplifier. The volume control on the phone acts as the master volume control for the system. With its front-mounted subwoofer enclosure and new speaker pods, the Slam-Pak sounds great! The last installation step was to configure the crossovers and sensitivity controls on the amp for the chosen speakers and source unit. 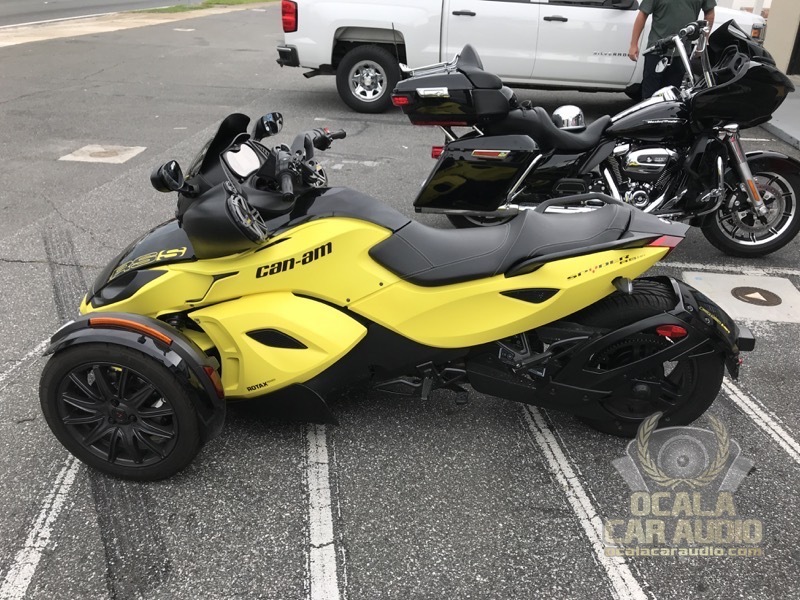 The client was thrilled with the sound of her new Can-Am Spyder SlamPak audio system. 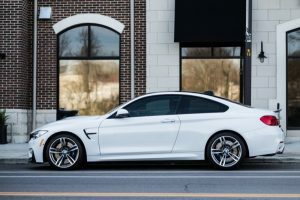 It’s incredibly easy to use and fits the vehicle perfectly! 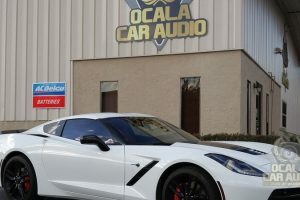 If you are in the Marion County area, drop by Ocala Car Audio to find out how we can upgrade your mobile audio system. 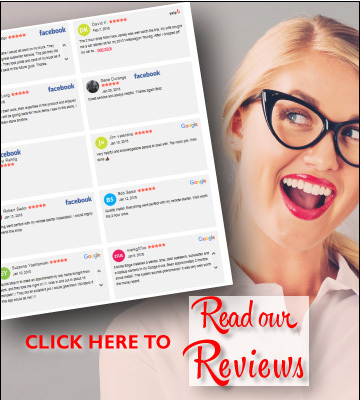 For more information or to schedule a consultation, give us a call or send us an e-mail using our contact page.